Easy-to-Make Date Night Recipes - What's for Dinner? Treat yourself and a special someone to this romantic menu, featuring date night recipes and easy-to-make aphrodisiac foods. 41% of homecooks would also make this recipe! Cool off with refreshing tomato, cucumber and peppers in this classic Gazpacho served with Sister Schubert’s® Parker House Style Yeast Rolls. 45% of homecooks would also make this recipe! This sophisticated salad combines your favorite greens with pistachios, Brie cheese and fresh raspberries. Tender, quick-cooking scallops help get dinner on the table fast! 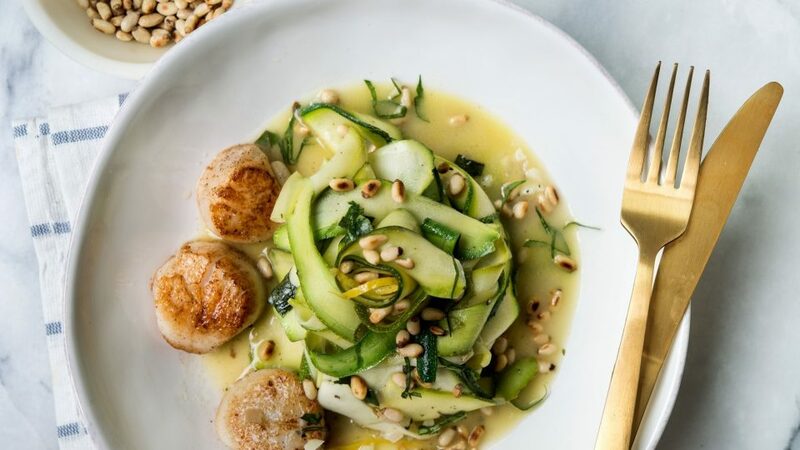 They join zucchini ribbons, roasty pine nuts, shallot, garlic and Girard’s® Champagne Dressing, and get a fresh finish thanks to basil and lemon zest. 42% of homecooks would also make this recipe! For an unforgettable individual dessert, try this coffee-kissed blackberry compote with fresh fruit, lemon zest, and Girard’s® Light Balsamic Dressing.